Blowout Sale! 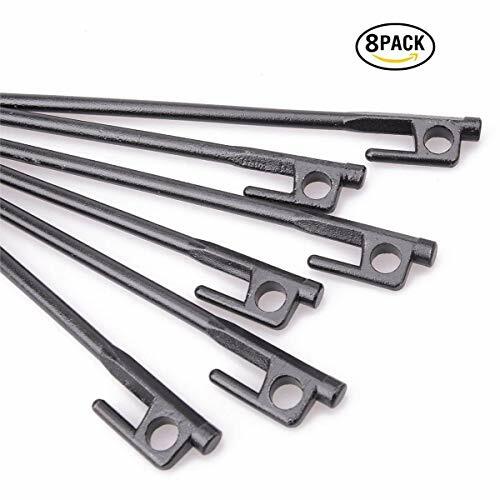 Save 59% on the CLSstar - Black Forged Steel Burly Heavy Duty High Strength Steel Camping Tent Pegs Stake for Outdoor 8 pack by CLSstar at Kerinci. MPN: 43237-2. Hurry! Limited time offer. Offer valid only while supplies last. Specifications: Length: 8-inch. Diameter: 0.28-inch. Color: Black. Material: Forged S45C Steel. package: 8 X Tent Stakes Pegs,1x Cloth Pouch. Length: 8-inch. Diameter: 0.28-inch. Color: Black. 8 X Tent Stakes Pegs,1x Cloth Pouch. head of the stake facing the ground. 3.Fasten the tent rope into the hook in the head of the stake. ✳️ Camping stakes length: 8/12 inches; weight: 2.47/6.45 oz, 8 pcs per order. ✳️ HIGH TENSILE STEEL - Made from forged S45C Steel with electroplated coating, Penetrate the roughest terrain, able to be driven through asphalt. ✳️Gives a more reassuring grip in most ground types to keep your tent secure. ✳️ With a length of 8 inches, these pegs are highly visible so you don't trip over them when walking around . WILL NOT BE LOST in the long grass! ✳️ EASY TO UES: With a durable cloth bag, Metal stopper and sharp tip make it easy to drive the stake into the ground, and pull out with the hole on the top. Tough enough to hold the tent against fierce wind. If you have any questions about this product by CLSstar, contact us by completing and submitting the form below. If you are looking for a specif part number, please include it with your message.